Obverse: Head of Athena right, wearing crested Attic helmet decorated with three olive leaves over the visor and spiral palmette on the helmet bowl. Reverse: Owl standing right with an olive sprig behind, and "AOE" in front, all within an incuse square. 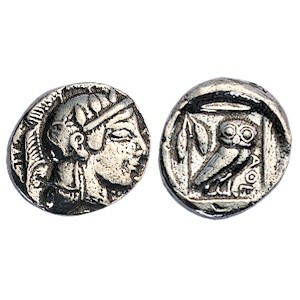 History: Athena was the patron goddess of Athens and was depicted on most Athenian coins with the owl and olive sprig depicted on the coin reverse. The owl, named the Glaucus, was Athena's sacred bird represented wisdom, and the olive tree was Athena's sacred plant and was a symbol of peace and prosperity. The inscription AOE on this Didrachm coin means 'Of the Athenians'. There are very few known Athenian didrachms, making this coin very rare.